Two years ago my life changed in wonderful ways, as I re-connected with a spirituality which had been a way of life for me in the Scottish Highlands 2,000 years ago. This is the story of how I embarked on the Druid path by joining the Order of Bards, Ovates and Druids (OBOD), a story that explains why tears came to my eyes the first time I read the prayer that unites all Druids, why I was completely manic within hours of finding my Australian Druid tribe and why I’ve been to a German forest and to the Isle of Avalon (Glastonbury) in the past few weeks to celebrate with Druids in the northern hemisphere. Druidry is a vital and dynamic nature spirituality that is flourishing all over the world. It unites our love of the earth with our love of creativity and the arts. Flowing through all the exciting new developments in modern druidism is the power of an ancient tradition: The love of land, sea and sky – The love of the earth our home. In 1974 I stood for the first time inside the circle at Stonehenge (there were no fences keeping people out at that time). I was intrigued but not particularly affected by this experience. 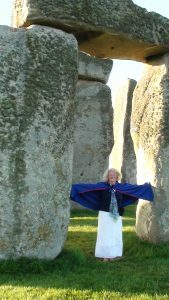 In 1993 I returned with my daughters, but it was not until 2010 that I felt the energy of Stonehenge. As I entered the circle in the company of a friend and a Druid priestess, I felt the power of the stones and knew I was embarking on a journey to an, as yet, unknown destination. We each chose a card from the Tarot’s Major Arcana to see what message Stonehenge had for us at that moment in our lives. My card was The Magician. At that stage I had not encountered the DruidCraft Tarot, but as soon as I did a year or so later and saw The Magician, I knew I was being led, for some reason, towards Druidry. ‘Open yourself to the power of Awen and Nwyfre, of inspiration and life-force, and let it flow through you and into the world,’ says Philip Carr-Gomm about The Magician. I was still a few years away from acting on that message. Upon my return to Australia I went to a psychic who tunes into your energy and channels your spirit guides. I had made this appointment before my trip to the UK. ‘I’ve seen you at various stages in one of your lives’, she said. She then proceeded to describe a scene that looked remarkably like the Burne-Jones, painting, The Last Sleep of Arthur in Avalon, the original of which I had seen on my recent travels and had found absolutely mesmorising. My guide, she said, was a Druid priestess and on my deathbed I had made a pact with her, that I would come back in another lifetime to help keep the old ways going. What did that mean? Why do oracles talk in riddles? I wondered. I asked if the lifetime she saw was in England around Stonehenge, Avebury or Cornwall – all places I felt an affinity with. ‘No’, was the answer from my guide…’Scotland, you have to go to Scotland’, she said. I was a little disappointed with that answer, I wanted to hear that it was a place I already knew. So off into the ‘who knows what that’s all about’ basket went the message about Scotland. At the time I organised occasional tours to places of spiritual interest and offered Tarot readings and activities to help people explore their inner journey as they visit places of sacred and spiritual significance. In 2012 I tried to organise a tour of sacred sites in south west England with a Tarot witch friend of mine, but we had to cancel due to insufficient numbers. ‘If I’m going to find a way to make this work, I need a partner in the UK,’ I thought. I’d looked several times at the website of Gothic Image tours based in Glastonbury. I liked their approach, so wrote and asked if they would be interested in an arrangement whereby I promoted their tour in south west England and came along as special guest offering Tarot activities. The answer was ‘yes’. In June 2013 I found myself on the journey From Avalon to Camelot and whoosh! …doorways into the past opened in rapid succession and I was speeding down the centuries to my Druid past. Now, you know from what I’ve written that the penny should have dropped straight away, but, no, it didn’t! It took a couple of days before I got the message and it came directly from my spirit guide. I was sitting in a meditative state by the crystal healing stone in the circle at Boscawen-un when I heard her voice. ‘Go to Scotland’, she said, ‘you’ll have fun!’ I woke up with a start thinking, ‘Of course, you told me that three years ago!’ I threw financial care to the wind, re-organised my flights and went to Scotland. The result was life-changing. Within days of being on the road it became clear that my spirit had lived in this land many times before. Memories, images and emotions poured forth as the spirit of place in this timeless landscape led me home. 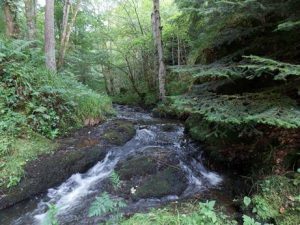 I saw the remains of sacred sites, followed streams and waterfalls through fairy glens, lay atop a magic mountain and soaked up the sun and the breeze of a fairy-tale landscape. No guide to this inner journey was needed, I simply lived in the moment and trusted what I saw and felt. Since then my life has been richer for being shown the joy my spirit experienced in another place, in times long past. 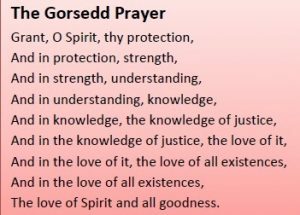 In the final days on Iona I came to understand what I had to do in response to the enigmatic message from my guide about helping to keep the old ways going. First and foremost, I had to learn about the old ways, hence the decision to join OBOD. I had to forge partnerships with people who are practising the old ways. I already had some contact with Philip Carr-Gomm through Global Spiritual Studies, so I wrote asking if he would like to present one or two online classes about the Druidcraft Tarot. This is now a truly magical deck for me – on my journey through Scotland the images on the cards sprang to life as they channelled stories from my past. Two excellent classes are now available – The DruidCraft Tarot – a gateway to inner wisdom. On the travel front, I increased my involvement with Gothic Image tours. In two other blogs Jamie George and I discuss aspects of what we call ‘soul journeys’. Soul journeys through sacred landscapes with Jamie George. 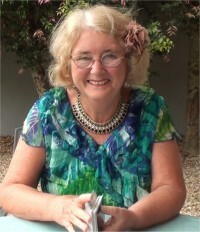 Linda Marson is a former President of the Tarot Guild of Australia and author of Ticket, Passport and Tarot Cards. Before the manuscript was even finished, Linda was onto the next stage of the Ticket, Passport and Tarot Cards journey – a series of 22 short programs for community television in Australia – one segment for each of the 22 Major Arcana cards. The series won an award for the best personal or spiritual development program on Australian community television in 2006. Linda has been reading Tarot cards for over 25 years and for many years wrote for, and edited the Tarot pages of Spheres, a spiritual magazine in Australia. She has presented workshops on various aspects of Tarot practice and organised major Tarot events involving internationally renowned Tarot experts. In 2011 she established Global Spiritual Studies. For more information about Linda’s Tarot courses and master classes visit her page on Global Spiritual Studies and her Experience the Tarot website. Do you identify with the kind of experience Linda describes? Do you have a story about signs you were receiving from the universe that led you to a wonderful place when you finally got around to seeing them? We’d love to hear from you.